Rome Rise of an Empire is one of a newest and latest video slot game developed by Blueprint gaming for which total reels are 5 and Paylines are 20. Total coins for the game are 20. This slot game is perfect for players who want some adventure and having fun with gladiators and warriors while their gaming. This video slot is playable at mobile phones, smart phones (Android, iOs or any) and either at Desktop and tablets. You can play Rome Rise of an Empire video slot using coin sizes of 20p per spin to up to £50 per spin. The game features a whooping number of (5) bonus feature and 5 modifiers. You will receive up to 10x of multiplier on your single free spin or regular spin. The game also has a jackpot of 500 times on your total stake. Rome Rise of an Empire is a very nicely designed slot game which takes you to the action packed stadium where you will see heart, diamond, club, swords, helmets, shields, a gladiator and an empress on the reels. 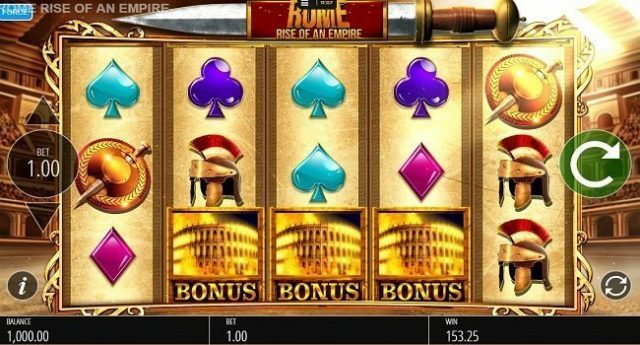 The Rome Rise of an Empire logo is the highest paying symbol of this slot which offers 25 times on your total stake if you are lucky to land the logo on 5 reels across your Payline. Legion’s Glory feature- during this feature anywhere from 1 and 3 stacked wilds will be added and a new payout calculation is made. Sword Strike feature – During this feature the bottom row of the game will be cut by the sword and the player will land some of the most winning combination symbols. Bonus Boost feature – During this feature of the slot machine, more scatter symbols will be added on the reels and they will increase your chances on winnings. Symbolus Maximus feature – During this feature any spin will be unfurl and will turn in to wild. Spears of Destiny feature –More winning combination including wilds will be added to the reels. The game also features 5 different bonus rounds and if you are able to land 3 or more of the Bonus symbols across your Payline then you will see which one is awarded to you and these rounds can be Urn Riches feature, Uprising feature, Volcanic Cash Free Spins feature, Empress’s Treasure Free Spins feature and Big Money Bonus feature. Volcanic Cash Free Spins feature- This feature gets you unlimited free spins and these free spins will only land when you land a stop on reel 3 and during this free spin a multiplier of 6x or 10x is also added. Uprising feature- This feature will get you cash prizes if you are able to destroy the turrets of a fortress. Empress’s Treasure Free Spins feature- get 15 free spins during this bonus feature of Rome Rise of an Empire mobile slot. Big Money Bonus feature- This feature of the slot will get you Big Money prizes and it would happen if you land 5 Bonus symbols on your reels. This slot machine is serious perfect for player looking to play real money slot game using some of the best online casinos in the world like Casumo Casino or LeoVegas casino.